While the later two quartets here divulge a more progressive expressive language than that of their earlier siblings, the music in all four works by Swedish composer Dag Wirén should not present a great challenge to your ears, unless you find the quartets of Bartok and Shostakovich out of your comfort realm. I would say the String Quartet No. 2 is, in its lightness and direct musical language, the easiest to grasp of these. It also has an instant appeal – or at least it did to me. The opening ‘Theme and Variations’ offers a very attractive main theme, slightly reminiscent of Shostakovich, but warmer emotionally and without any hint of angst. There follow four variants, quite colorful and energetic, and then the main theme is recalled. The ensuing Scherzo and Finale are both imaginatively wrought and quite effective, if without a weighty presence. That sense of lightness continues in the String Quartet No. 3. The main theme of the first movement bears a resemblance to that in the finale of the Bartok Second Violin Concerto (1937-38), a work that was then new. But there is little otherwise that is Bartokian in the music, which has, like the Second, a Nordic character and sense of emotional warmth and joy. The first movement is very energetic, while the second offers a lovely Andante main theme that later takes on Sibelian characteristics in the quivering string writing when the tempo changes from Allegretto to Vivace. The ensuing panel is a brief and quite attractive Presto, while the Finale (Allegro) is a charming Rondo that begins slowly but eventually turns lively and gains in confidence and joy. The Fourth has a tougher veneer than the previous two quartets as it exudes a sense of darkness, in part from its more chromatic writing. It is nearly the length of the earlier works, but is cast in five movements, with the second and third being very short-breathed Intermezzi. The first movement begins in a relaxed (Calmo) but mysterious mood, then turns agitated and driven before returning to the eerie serenity of the opening. After the pair of Intermezzi, a gloomy Lento allows no hint of sunlight, setting the stage for an anxious, emotionally conflicted Allegro molto Finale that offers barely a glimmer of hope amid much struggle and tension, the work closing quietly, pessimistically, in the end bringing to mind the darker quartets of Shostakovich. The Fifth Quartet is, at thirteen minutes, the shortest of the four here. Cast in three movements, it also contains mostly cloudy skies, tension and struggle. The opening panel is unsettled, brimming with anxiety and unresolved conflict. The second movement retains the gloomy intensity, though when the tempo changes from Andante espressivo to Allegro capriccioso the mood brightens briefly. The Finale, perhaps the most convincing of the three movements, contains material previously heard but now in different guises. The music is more muscular and determined, but eventually its defiant manner yields to the darker elements and the work ends quietly, perhaps despairingly. Now you ask, are these works masterpieces, or at least worth exploring? They are perhaps minor masterworks, the first two, as suggested above, having direct appeal, the latter pair likely needing a little time to sink in. If your tastes extend to 20th century string quartets of a mostly accessible expressive language, you should find a good deal here to enjoy. 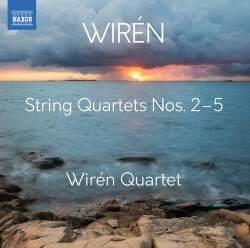 The performances by the Wirén Quartet sound totally convincing to my ears, though these works are new to me and the competition is very thin: only the Lysell Quartet, on the Daphne label, has a currently available recording of all four of these works. That said, these new efforts on Naxos are perfectly fine, and those interested in this music will be served well by them. The sound reproduction is excellent and the notes by Richard Whitehouse are most informative.